Eggplant is one of the unique vegetables. I used prawn in it. You can make it vegetarian dish or chicken one. 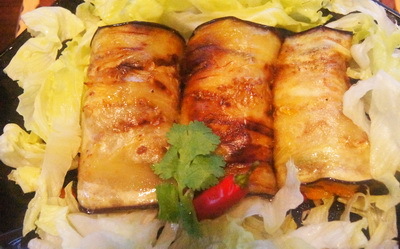 Hope you will like fusion Grilled eggplant with stuffing recipe. 1. 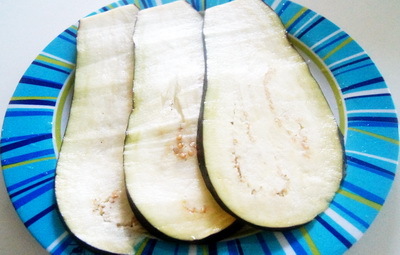 Cut the eggplant length wise. Wash it and pat dry it. 2. Add turmeric and salt on sliced eggplant. Spray the oil each side and grill till it is half done. 3. Heat the pan with oil and add prawn. 4. 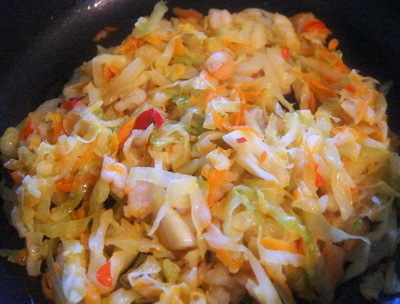 Stir it and after 2 minutes add cabbage, chillies and salt. 5. When cabbage is about done, add grated carrot. Stir well and after 2 minutes remove pan from heat. Let it cools down bit. 7. Place it on an oven proof dish and spray oil. 8. Bake it about 20-25 minutes on 170˚c. 9. 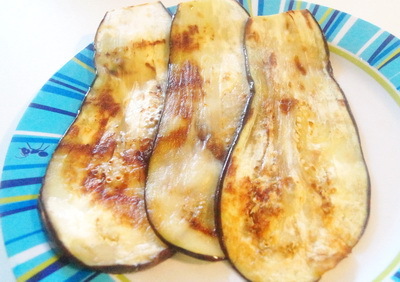 Serve grilled eggplant with stuffing with polau/ pilaf. Great recipe, Rownak. I love eggplant and anything made from eggplant. This recipe is looking awesome, I would say Bangladeshi recipes fro eggplant at its best.